Another Daisy picture! 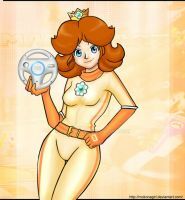 Looking at my older pics of daisy, I felt I didn't represent Daisy well enough, here another attempt. I actually have a sunset version so I might upload that too. That fake toad is actually Original character and the arrow box.They have nothing to do with the mario land 2. I couldn't find any good pics (or any pics) from Mario land 2 to get ideas. Great coloring job, man! Especially noteworthy is the gradient in the sky; the quick transition between hues easily sets off the desert at high noon look. haha, thanks man. I love the fake toad, that was last minute too. I still feel like this picture still isn't enough for some reason.. any ideas?.. I'm gonna upload the sunset one tonight. I think thats more fitting. Looking forward to the sunset version. thanks,I'm gonna change the colors a bit. This Laptop tricked me.. The color are suppose to be lighter than this.